Buzzy was one of Thomas Jefferson’s farm dogs. She lived with him in Monticello farm. 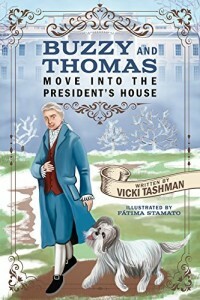 When Jefferson is elected on 1801 he moves to the white house and takes Buzzy with him. and live in a new place that she doesn’t know. Where will she sleep? Where will she eat and play? and she did move into the white house with him when he was elected. the move. They would surely identify with Buzzy’s fears.